Deep inside the alleys of Mussaffah stands the long-awaited Armenian Church, which opened its doors three weeks ago. 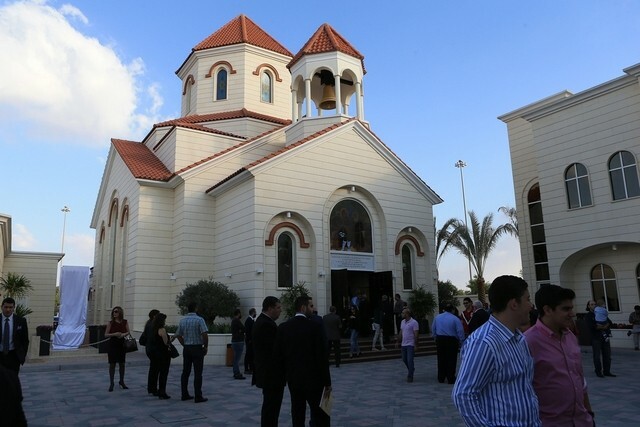 About 1,000 Armenians living in Abu Dhabi are thrilled to have their own church, and it is one that has been designed according to their traditions and architectural style, reads an article by Haneen Dajani published by The National. The 2,475-square-metre building has three main structures placed in a U-shape. The main church building stands on the right and next to it in the centre stands the archbishopric. On the left is a building partially constructed of glass and decorated with the Armenian alphabet. A statue of Mesrob Mashdots, the theologist and linguist who founded the Armenian alphabet, lies ahead. “Since the letters were founded in 405 they did not change, only two letters were added, the O and the F,” said Raffi Simonian, secretary of the council of the Armenian community of Abu Dhabi. The translation was begun in 406 and took Mashdots and a student three years to finish. Mr Simonian said that the support of governments in the Middle East in general, dating back to the days of Salah Al Deen when he entered Al Quds, helped. When the first Armenians arrived in the capital in 1976, they established the Armenian Sunday school to teach youngsters their language and to keep the community together. In 1980, the Armenian pope in Lebanon established a council, “and since then until 2005, we were trying to have a piece of land from the government [to build a church] but we had a problem; the members were not fixed and they kept coming and going, so the Sunday school was OK for the time being”. For church activities they used to borrow the Greek Orthodox Church every other week, and the Greek Orthodox borrowed the Armenian church in Sharjah every other week. The priest held mass one week in Sharjah and the other in Abu Dhabi. In 2005, Sheikh Mohammed bin Zayed, the Crown Prince of Abu Dhabi and Deputy Supreme Commander of the Armed Forces, issued a special decree from the diwan and donated land to build the Armenian church. So far, a mass is held every Friday, and celebrations for holy and national holidays will take place at the church. In the near future, a priest is expected to be based there so the church will be open on a daily basis. Anita Shahmirzayan said she cannot wait for that to happen. “If I’m feeling down or have a certain issue I can just go and pray, I don’t have to wait for mass,” said the 36-year old bank manager. The complex on the left, which contains a ballroom, will be the base for the Sunday school. “Now we have our own church and it has a ballroom, so if there is a celebration or a funeral or any occasion we can do it here – no need to rent places,” Ms Shahmirzayan said. Once Arpy Eskenian steps inside the gate of the church she says she feels she is back to her original home. Mrs Eskenian, 49, plans to attend mass weekly with her husband and 20-year-old son. Armenia was the first country to declare Christianity as its official religion, in 301.